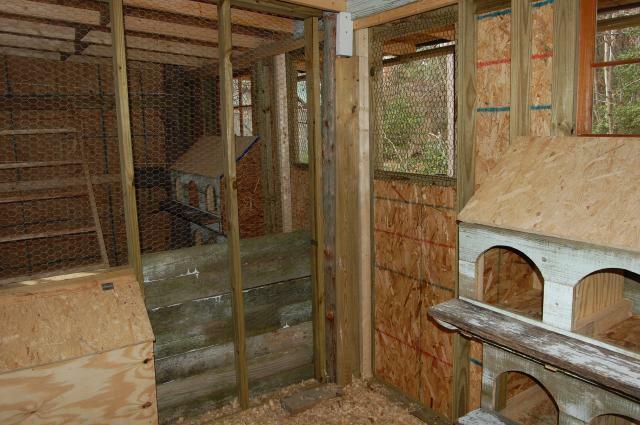 This project began simple enough, build a coop separated in two to keep my buff orpingtons on one side and barred rocks on the other. 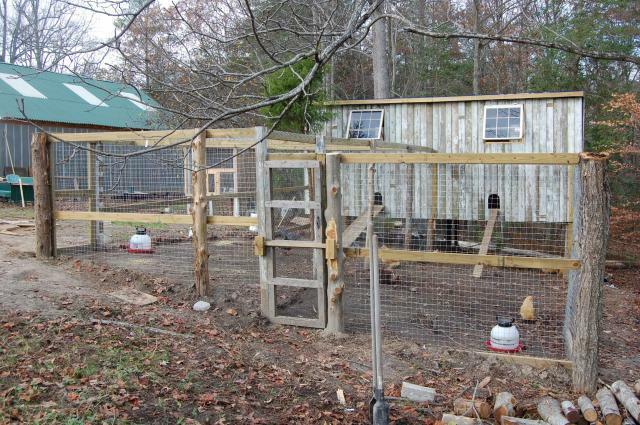 Once I got into it, it evolved into a 2 month project that met my requirements of what I felt a coop should be. It first had to be predator proof, easy access, easy to keep clean and plenty of ventilation, as well as sturdy enough to weather all conditions and last a long long time. 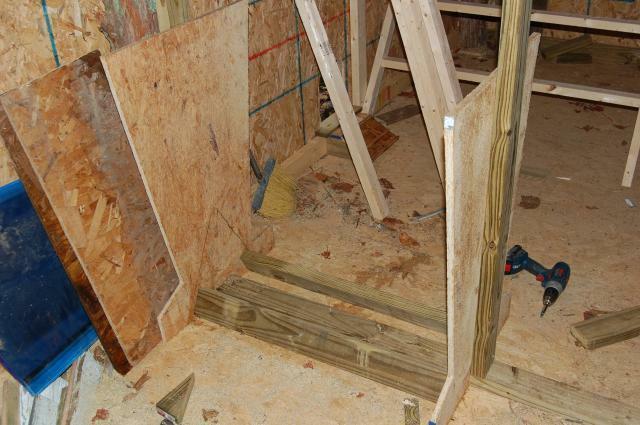 Starting off with 6 cedar posts I cut out of the woods I framed the floor with 2X6s and 3/4" plywood and the roofing with 2X4s. 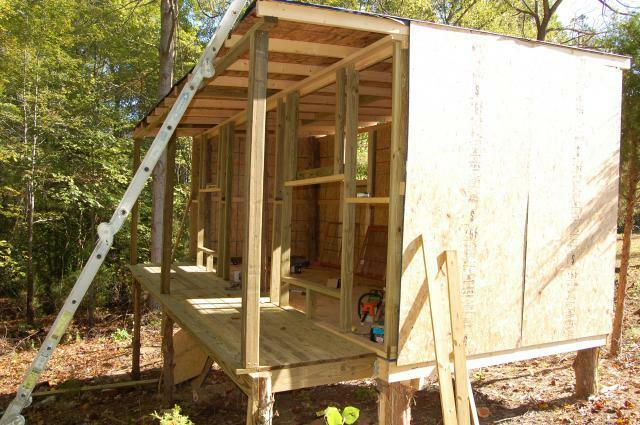 Framing up sides and adding windows. 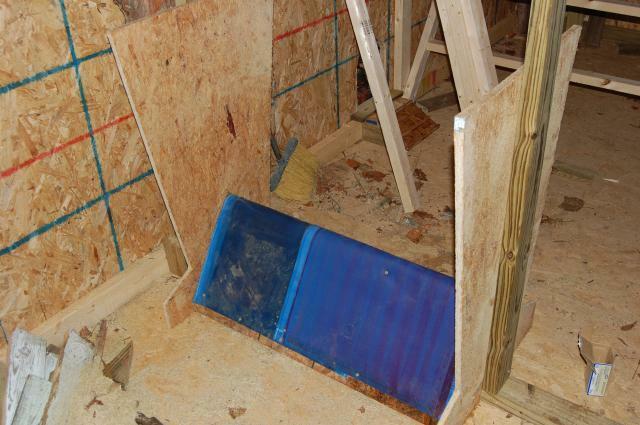 I used 7/16 OSB board and tin for the roofing.The tin was the most expensive part of this project. $30 dollars per 12' sheet and I need 10 of them. 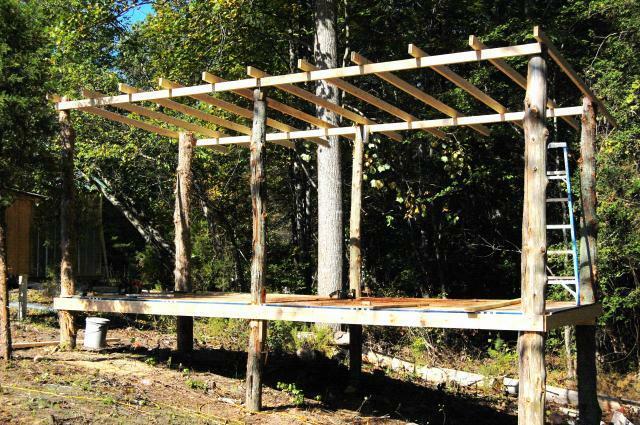 I'm building a rear covered deck for the back of the coops. 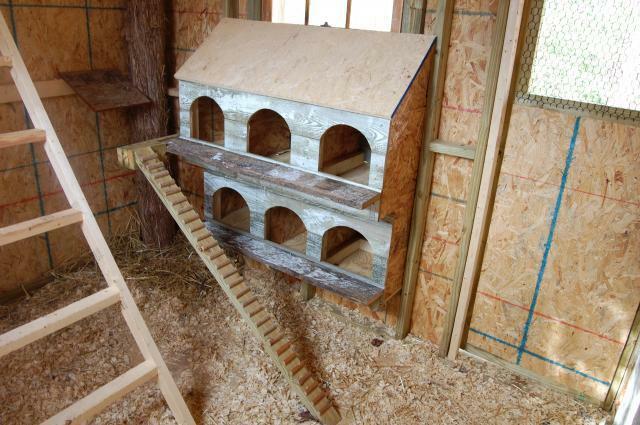 I intend to access the nests from here without having to go into the coop itself. Using old boards from my parents old fence I covered the 7//16 OSB with the weathered fence boards for added protection. Starting on the run. 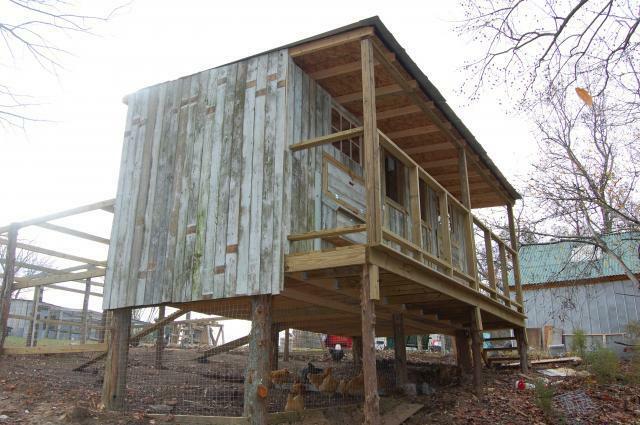 Roosts are completed using 2X3s. 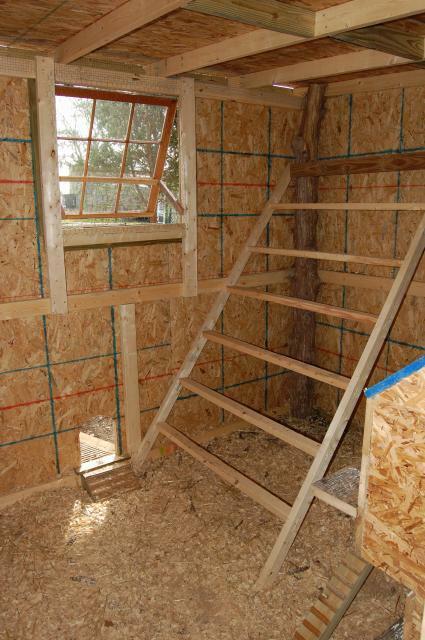 I constructed the nest units separately and inserted the whole set into a 3'X4' opening in the back wall. completion of the nests with ladder for the upper row. 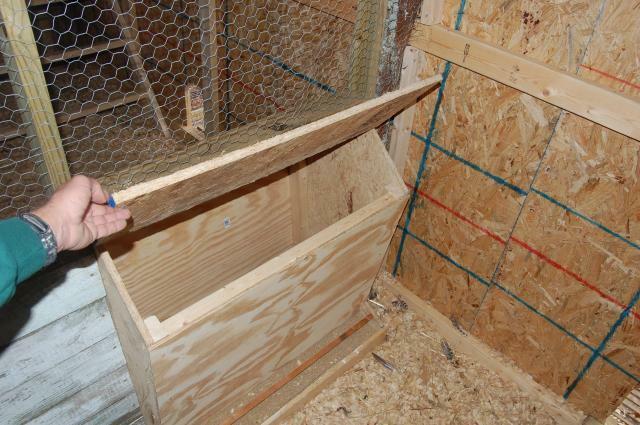 My BR's and BO's aren't due to start laying until January but I ready for them when they are. I can access the nest from the outside which you'll see later. 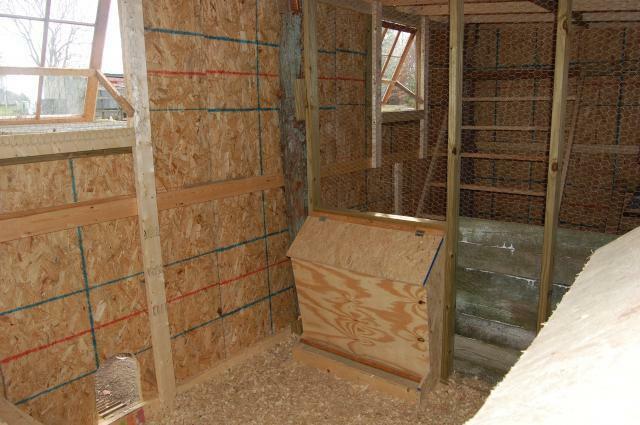 The roost, opening to the pen and ventilation window. Constructing a self feeder. I modeled this after one of my dads old hog feeders. I had no idea if it was even going to work when I started. Using some rubber matts from a printing press (my old job) for diverting the feed to the trough. You can use sheets of tin which is what I originally intended but these were available and they were free. The self feeder completed. 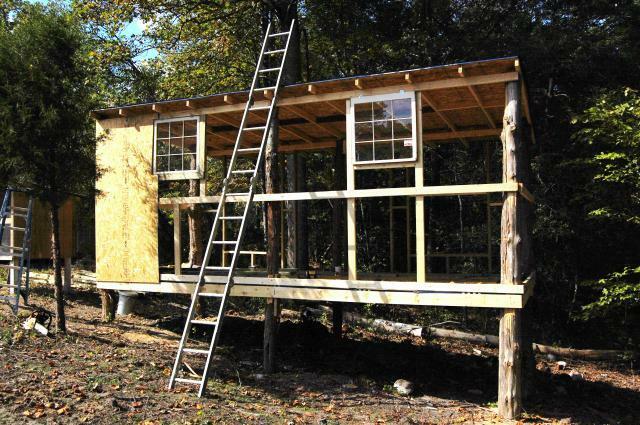 It's designed to be used for both sides but by only building it in half it could work in a single coop. 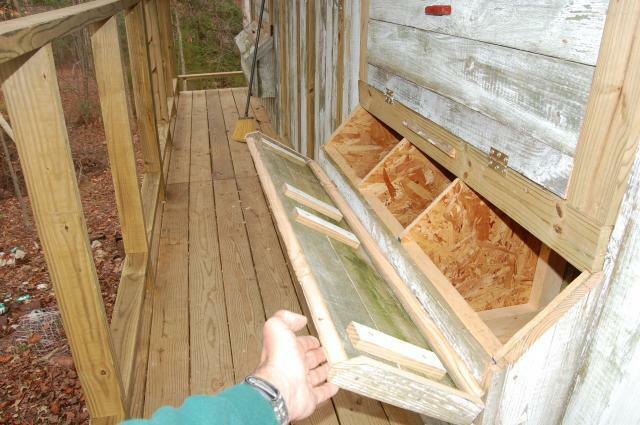 Hinged top access for the self feeder. It holds up to 200 lbs of feed and works beautifully. 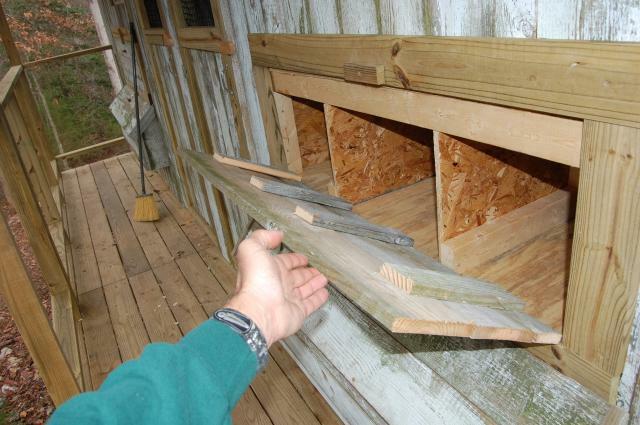 When the chickens eat what's in the trough it slides down and replaces it . I pretty much don't have to worry about feeding them for an entire month. Interior completed. Time for everyone to move in. I used a heavy guage 2"x 2" wire (available at Lowe's) for the pen. 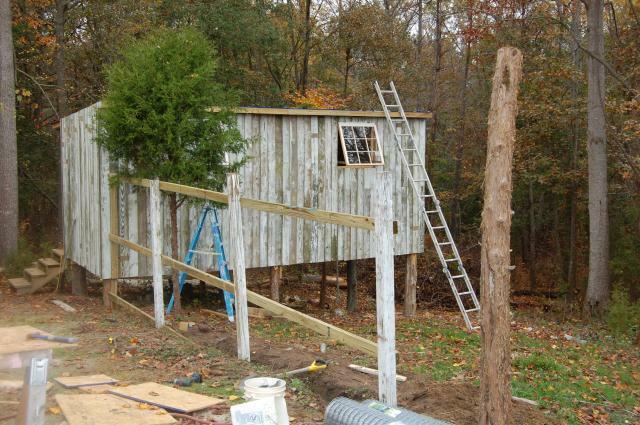 All fencing is tacked onto treated 2x4's and buried up to 12" under ground and covered on top. 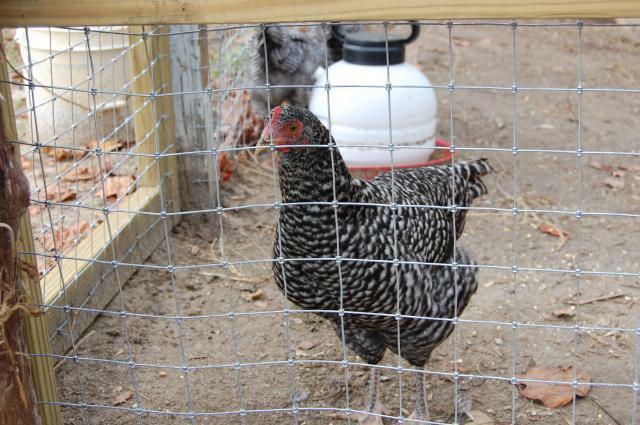 Nothing is getting in this pen. 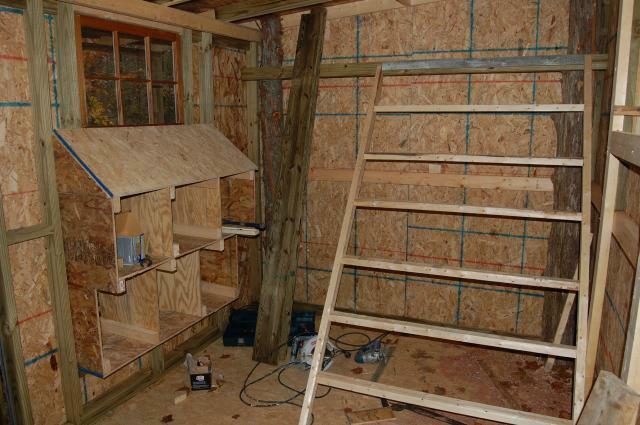 The rear deck and nest access. I also have a door to each coop. Access to the bottom nest row. 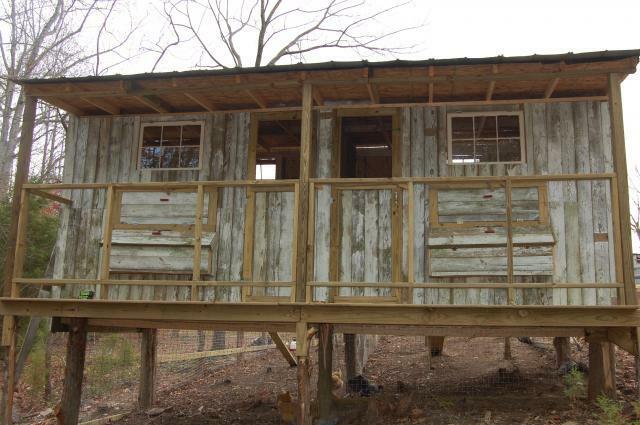 The back of the coops. 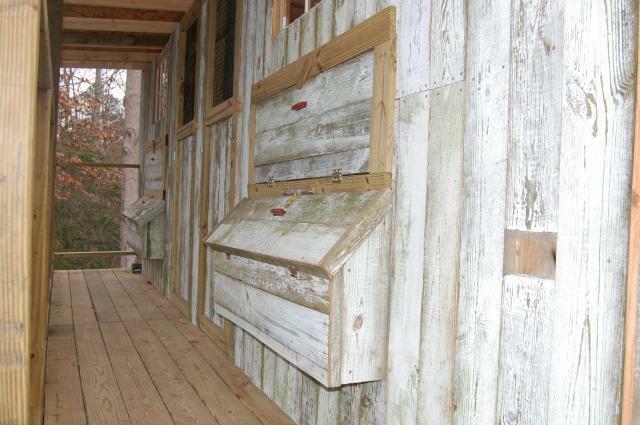 3' deck walkway with access to both sets of nests and doors to each coop. Everyone appears to be happy with their new home. It took me a lot longer to complete than I planned but I'm pleased with the finished product. 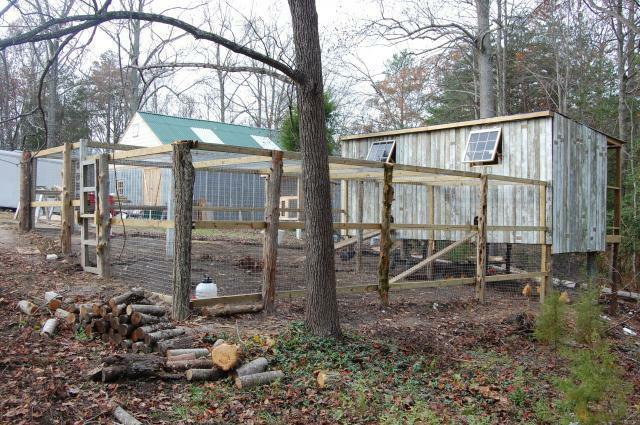 The coop is 8' X 20' housing separate 8' X 10' coops under one roof. 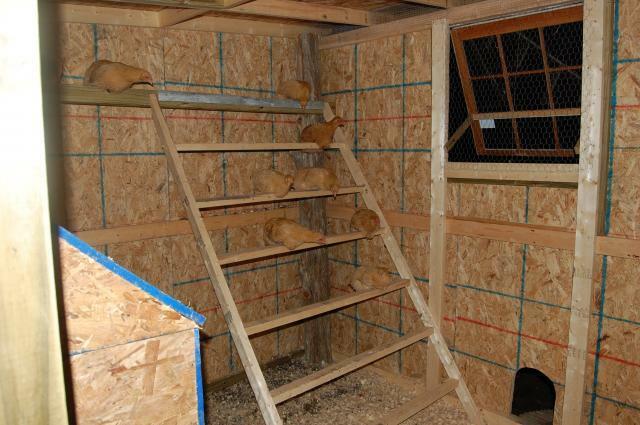 The runs are 10' X 25' each, not including underneath the coop itself. The chicks seem very happy with plenty of room to run around and scratch, oblivious that they are well protected and have a warm dry place to sleep. I love this! We have an abundance of cedars, too. wow!! this is awesome!! 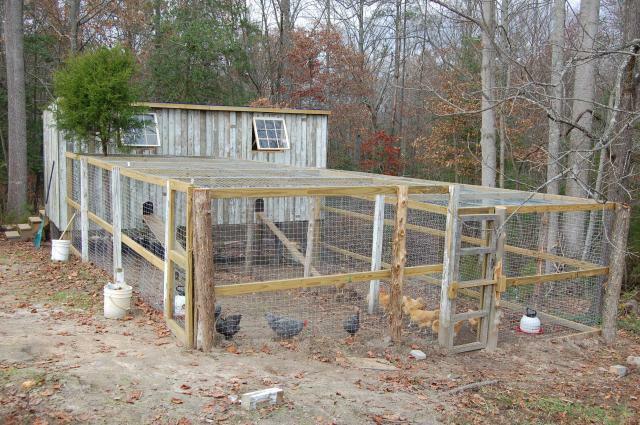 How many chickens do you keep here?